My mom's been cleaning house again--translation: THROWING AWAY COOL OLD STUFF--and thank goodness, instead of consigning it to the town dump, or to the local resale shop, where it would have sat unloved until the end of days, she packed up and shipped, in a Harry & David Fruit of the Month cardboard box (they're still getting those? Grapefruit in January! Whoohoo!! ), my great-grandmother's mint beaver muff. As I unpacked it, the kids, eating their breakfast cereal, were agog. "To keep your hands warm, sillies." "Didn't people have gloves in olden days?" "Well, yes, but . . . "
Logical questions on the part of my genius children, for which I didn't have adequate answers. Further interrogation of mom revealed that the muff was worn on long car rides, in the days when cars were unheated. Hmm. A handful of mouseclicks determined that muffs have been popular among men and women since at least the 17th century, and that beaver pelts were favoured for their fine, dense fur. 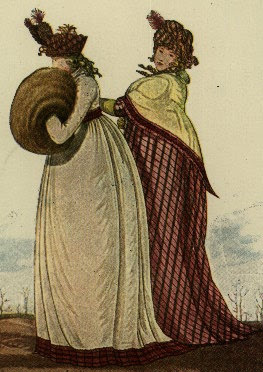 They were showy bits of kit in the Regency days, the bigger the better, and were frequently worn during bracing outdoor strolls. So that's the history. But how to make the muff functional today, when cars have not only central heating, but bum warmers, and bracing outdoor walks no longer involve ankle-length skirts and pelisses? I tossed and turned the muff, considering. 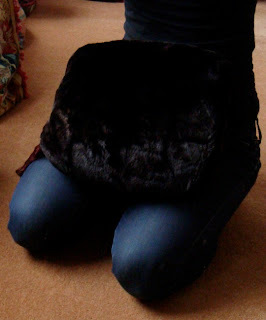 One end could be sewn up and straps attached, to make for a cunning fur backpack. Which, come on, I'd never wear. Or it could be cut in half, and the ends attached to a cloth coat to make showy cuffs. But again, no not really. Then, bing, the answer. The one true place to carry a vintage fur muff--on an airplane, back in the usual accomodations in cattle class. Where the air is always frigid. The blankets are hopelessly inadequate. And the seat configuration makes it impossible to squash a pillow into a comfortable headrest. The muff would solve all of the problems and more. So once again, this old muff is going places. Prepared for takeoff? Yes indeed. I l-o-v-e my fur muff. I got it at a flea market for $4 and it is in near perfect condition. I keep my gloves and hankies in it when I go out. It also doubles as a soft pillow if I get tired in the car. I've always wanted a muff and yes an airplane would be the PERFECT place for it!! I think imma love my muff too! And no, Elegance, I had to work very hard to write this uninuendoed. Out of respect to my great-grandma's muff.